BENEO’s endosperm rice proteins is an all-natural, gluten-free, non-GMO, hypoallergenic ingredient with an excellent amino acid profile and digestibility. The latter as well as its hypoallergenic profile make it the ingredient of choice for baby food applications. 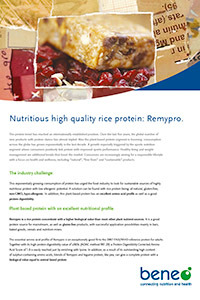 Remypro, having a high protein content (>79% ds) is a concentrated source of rice proteins, higher than almost any other plant-based protein source. It is a good protein source for mainstream, as well as gluten-free products. BENEO’s Remypro is an ideal plant-based protein source for the creation of gluten-free extruded cereals. Our rice protein do not only allows to include significant levels of protein with only limited impact on product expansion rate, it also considerably improves crispness and stable bowl life. BENEO’s Remypro can easily be incorporated into protein/ energy bars and (gluten-free) baked goods to obtain high-protein products with excellent taste and texture. Thanks to its high digestibility and excellent amino acid profile, Remypro can easily be used alone or combined with other proteins to formulate instant nutrition mixes like meal replacement drinks and shakes, enriched with proteins. Our experts can help you identify the ideal solution for your application. For detailed ingredient information, visit our Solution Finder. 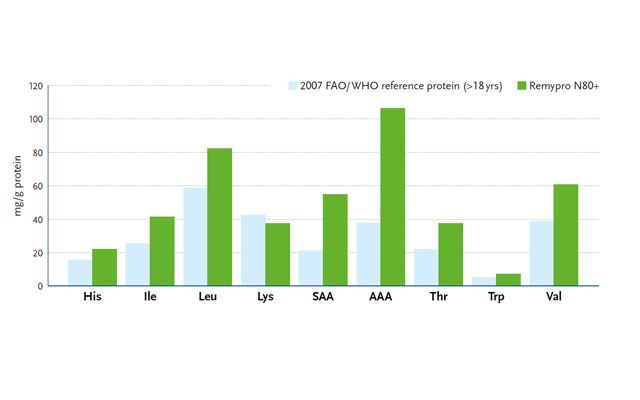 Essential amino acid profile of Remypro. Get to know rice protein better.